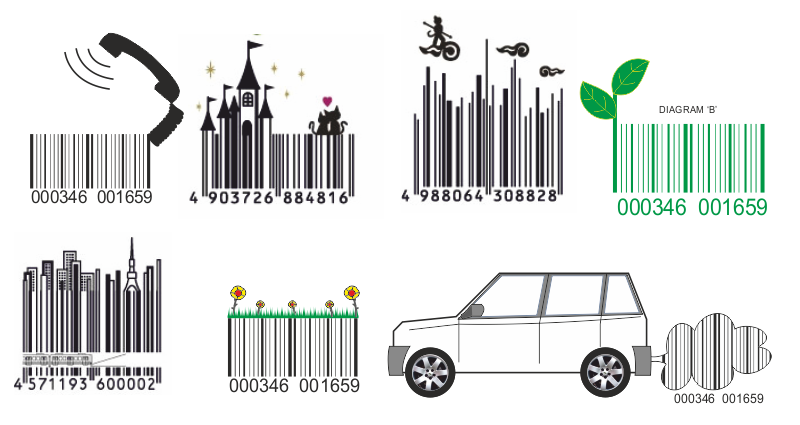 Although barcodes are often plain, they can be presented in a more graphical form. This makes them appear more appealing and interesting. However, they are still a number of vertical black lines that vary in their thickness and distance apart. Barcodes are used to control the manufacturing process (production line) and they play an important role in ‘supply and demand’, including the distribution and transport of products to the customer. Computer systems use barcode technology to keep track of products as they are manufactured and progress down the production line. Barcodes are used to track the progress of products as they are distributed to customers. In shops and supermarkets, the barcodes on the packaging of products, are used by computer systems to monitor sales and the order further supplies. 1. On a production line a component / product will be issued with a barcode. As the product progresses down the production line the barcode is scanned repeatedly. This allows the computer system to monitor the products progress, as it is assembled and quality checked. The assembled product is then ready for distribution. The computer system also records the number of products/units manufactured, keeping accurate records such as times and dates. At every point on the production line and in stores awaiting for distribution, the computer system will know exactly where the product is located. The example production line seen below has been simplified. This production line is for the assembly of a bicycle. As the bicycle frame travels down the production line each person at a workstation workstation has a specific task to carry out ( see below). Each component/part has a barcode, ensuring the computer system can keep track of the products progress, along the production line. 2. Distribution. The computer system allocates each product or box of products to a ‘lorry’ for distribution. The barcode again plays an essential role. Each barcode will be allocated the correct address for a retail outlet or for an individual customer. As the product is transported, its location is monitored and recorded. For instance, when sending a package by Royal Mail (UK) it is possible to log on to the Royal Mails website and find out where your ‘package’ is geographically located. 3. Retailers / shops / catalogues. A checkout operator in a supermarket scans a product barcode as the customer passes through the checkouts. The price will be automatically displayed and as more products are checked out the total cost will be calculated. This means the checkout operator does not need to manually type in the price of each product. This makes the checkout procedure less time consuming and it is less likely that mistakes will happen. 4. Supply and Demand. As products are scanned at the checkout, the supermarket computer system will automatically determine whether more products need ordering so that replacements are placed back on the shelves. This saves time and manpower as it does not require an employee to constantly check the shelves or to manually order replacement products. Stock control is much more efficient as a result of the introduction of barcodes.